The General Data Protection Regulation (GDPR) is a regulation by which the European Parliament, the Council of the European Union and the European Commission intend to strengthen and unify Data Protection for all individuals with the European Union. Here at Gemma Hayes Recruitment, we take your privacy very seriously and will only use your personal information, upon receiving your permission to administer your account and registration with my recruitment agency. When completing ALL registration paperwork as appropriate with my recruitment agency, you may be asked to enter your name, home address, contact details, e-mail address, provide us with original proof of photo identification, PPS information, P45, P60, your Curriculum Vitae, Bank Account Details (only requested if you may become a temporary worker via Gemma Hayes Recruitment, based at one of our client’s facilities, with us being your Employer and in order to process and pay your income, via Electronic Bank Transfer). 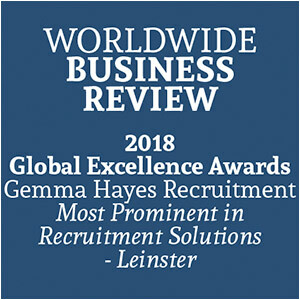 Any information which you provide in this way, is used by Gemma Hayes Recruitment ONLY and this will be in line with the purpose for which you provided the information for. We continually strive to improve our website offerings, based on the information and feedback we receive from you. The email address you provide for application purposes, may be used to send you information and updates pertaining to your application, in addition to receiving occasional company news, updates, related product or service information, etc. Original proof of photo identification (proving that you are whom your cv states you are). PPS information, P45, P60, Bank Account Details (only requested if you become a Temporary Worker via Gemma Hayes Recruitment, based at one of our client’s facilities, with us being your Employer and this information will then be required, in order for us to process and pay your income, via Electronic Bank Transfer and for tax/revenue purposes). Please note, none of the information in point 6, will be conducted on-line. This information to collected from you off-line and when Fully Registering with Gemma Hayes Recruitment. Your CV may be submitted for ALL suitable vacancies that arise with our clients, however, only upon us receiving your consent. The IP address of the visitor’s web service. The top-level domain name used (for example - ie, .com or .net). We will make no attempt to identify individual visitors or to associate the technical details listed above with any individual. It is the policy of Gemma Hayes Recruitment never to disclose any technical information in respect of individual website visitors to any third parties unless obliged to disclose such information by law. The technical information, if any, will be used only by Gemma Hayes Recruitment and only for statistical and any other administrative purposes. You should note that technical details which we cannot associate with any identifiable individual, does not constitute “personal data” for the purposes of GDPR. We do not sell, trade, or otherwise transfer to outside parties, your personally identifiable information. This does not include trusted third parties who assist us in operating our website, conducting our business, or servicing you, so long as those parties agree to keep this information confidential. We may also release your information when we believe release is appropriate to comply with the law, enforce our site policies, or protect ours or other rights, property, or safety. However, non-personally identifiable visitor information may be provided to other parties for marketing, advertising, or other uses. The right to access data relating to you (“access right”). The right to rectify/correct data relating to you (“right to rectification”). The right to object to processing of data relating to you (“right to object”). The right to restrict the processing of data relating to you (“right to restriction”). The right to erase/delete data relating to you (i.e. the “right to be forgotten”/“right to erasure”). The right to “port” certain data relating to you from one organisation to another (“right to data portability”). At any point in time, you can invoke your “Right to be Forgotten” in writing, to Gemma Hayes Recruitment. At this point, your entire history will be removed from our systems and files. If we do not receive an instruction in writing, for you to exercise this “Right to be Forgotten”, your details will remain on our systems/files. Please note however, at all times, your details will ONLY be used/shared for vacancies, with your consent. When you submit a support question, we may collect your first name and last name (only when provided), contact number and your email address, to enable us to correspond with you. When you subscribe to our newsletter, we collect your name (only when provided) and your email address, so that we can correspond with you. Your personal data will not only be stored in the website’s database but also in Mailchimp, the application we use to send our newsletters. In Mailchimp we only store your email address and when provided, your name. Address: Office L, Wexford Enterprise Centre, Strandfield Business Park, Kerlogue, Rosslare Road, Wexford.